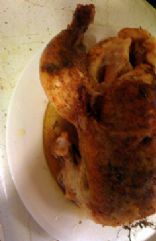 I love tandoori chicken, so the last time I had a whole chicken, I decided to just roast the WHOLE thing in a tandoori marinade. Note that the cayennne, hot peppers and black pepper are optional - use one or more as desired. 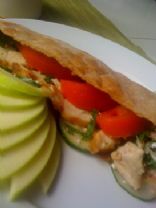 The recipe here uses a skinless chicken - the fat and calories will be MUCH higher if you leave the skin on. The foil is essential if you don't want a dried-out chicken - remember that this is skinless chicken! You can use the same marinade and just coat 4 chicken breasts or 4 leg-and-thigh pieces instead, if you prefer a quicker, less messy preparation. 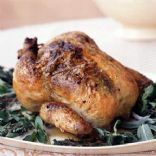 A simple roasted chicken that is juicy with or without the skin.